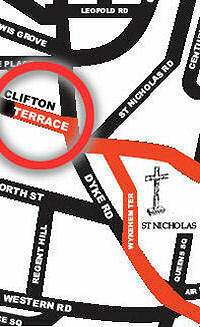 Clifton Terrace is one of the must-have places in Brighton. It was built in 1845, after the station was established. Everything west of the station went upmarket, as the middle-class moved towards the clean air of Hove. Swanky merchants didn’t want fishermen’s housing, so the traditional and brick was covered in stucco. The stucco looks pale in old prints, so nowadays it’s painted creamy white. The original black iron railings were probably manufactured at the foundry next to Frederick Gardens. If you look at the private gardens on the other side of the street. 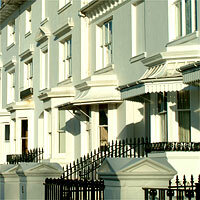 You’ll find rosemary and lavender; plants that thrive on Brighton’s intense light.